With so many spec lists to navigate and so much jargon to understand, choosing the right audio interface can be tricky. But when you get down to it, what you really want is a device that will enable you to accurately capture and play back high-quality audio, and that’s what you get with Focusrite’s Clarett range. If you’ll allow us to talk technical just for a moment, the Thunderbolt-equipped Clarett 2Pre, 4Pre, 8Pre and 8PreX come with specially-designed, high-performance, low-noise (-128dB EIN) mic preamps that benefit from a low-distortion, ultra-linear design. The result? A clean, open and transparent sound that accurately represents what you’re recording and will leave you with a smile on your face. For a vintage touch, you can also engage the Air feature, which enables you to switch-in an analogue model of a classic transformer-based Focusrite ISA mic pre. And with a round-trip latency time of just 1.67ms*, you should have no trouble recording through your favourite plugins in real-time. Of course, everyone has different channel count requirements, and that’s why Focusrite offers Clarett models with two, four and eight preamps. And if you ever need more inputs, you can add them later via ADAT. On the software side, in addition to Plug-in Collective, which provides exclusive offers, tutorial content and more, Clarett interfaces ship with the Focusrite Red Plug-in Suite, the Time and Tone Bundle from Softube and one Addictive Keys instrument from XLN Audio. Clarett interfaces also offer Focusrite Control, the company’s software mixer, which is designed for easy configuration of monitoring and routing setups. 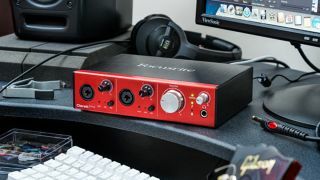 For more on the Clarett range, check out the Focusrite website.